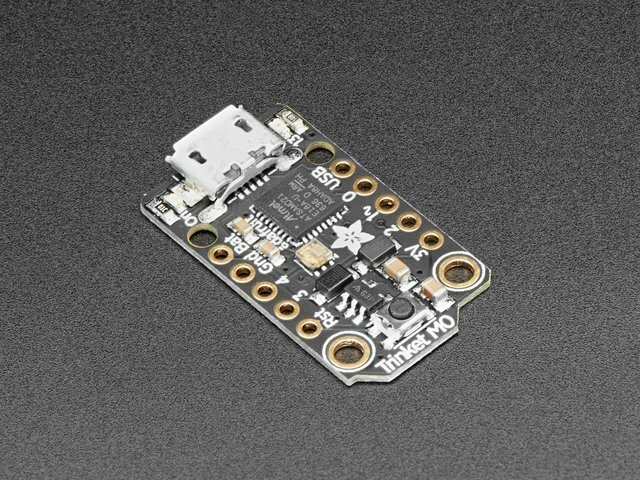 USB - This is a voltage OUTPUT or INPUT pin - it is connected directly to the micro USB port +5V pin, so if you are powering over usb, this pin will give you 5V out at 500mA+. Or if you are using the Trinket as a USB host or you have a good reason, you can put 5V into this pin and it will back-power the USB port. 3V - This is the 3.3V OUTPUT pad from the voltage regulator. It can provide up to 500mA at a steady 3.3V. Good for sensors or small LEDs or other 3V devices. Next we will cover the 5 GPIO (General Purpose Input Ouput) pins! For reference you may want to also check out the datasheet-reference in the downloads section for the core ATSAMD21E18 pin. We picked pins that have a lot of capabilities. All the GPIO pads can be used as digital inputs, digital outputs, for LEDs, buttons and switches. All pads can also be used as hardware interrupts inputs. On a Trinket M0, the GPIO are 3.3V output level, and should not be used with 5V inputs. In general, most 5V devices are OK with 3.3V output though. Digital #1 / A0 - this is connected to PA02 on the ATSAMD21. This pin can be used as a digital I/O with selectable pullup or pulldown, capacitive touch, analog input (use 'A0'), and true analog (10-bit DAC) output. It cannot be used as PWM output. On the bottom of the Trinket M0 you will see two small pads. These are used for our programming/test but you can use them too. On the off chance you want to reprogram your Trinket M0 or debug it using a Cortex M0 SWD debug/programmer, you will need to solder/connect to these pads. We use them for testing and you will likely never need it but they are there if you do! This guide was first published on Aug 23, 2017. It was last updated on Aug 23, 2017. This page (Pinouts) was last updated on Apr 19, 2019.